At that time Vickers-Armstrong at Weybridge was a serious aircraft manufacturer, employing 20,000 souls. (It's now a sort of Business Park, and a Museum). In 1961 the Wind Tunnel needed to model a wing, designed by Barnes-Wallis. It was too hard to make its complex shape in the usual way, and the Pegasus computer was used to make a paper tape which steered a milling machine. This machine patiently cut down to lots of individual spots, which could then be smoothed together by a craftsman to produce the surface. Laurel, in Harry Hitch's Maths Services Department, had produced a Pegasus Autocode program which generated the required paper tape. I was involved as a junior engineer in Geoff Crocket's (or Crocker? Cheerful guy in a white jumper) Wind Tunnel Department. I fell in love, not with Laurel (who was very nice, but engaged to Chris, and I to Sallie), but with the Pegasus. I transferred to Maths Services, and learned, through sardonic and effective instruction from Donald Davies and John Elliot, how to program in Pegasus Assembly. See George Felton's book here (a 32Mb pdf). And in this way began my 'forty-two years before the screen'; for I never returned to the regular engineering in which I'd been expensively trained at the RAE. 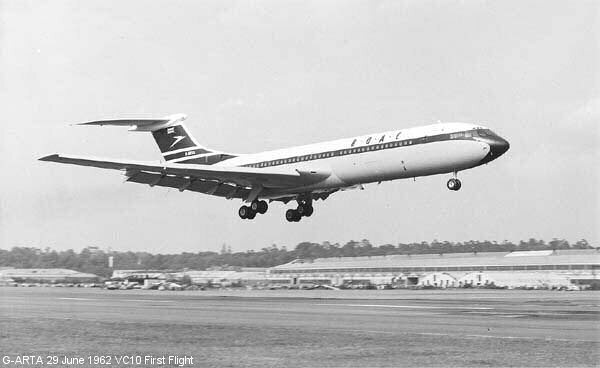 It turned out I was a bit of a star at programming the Pegasus, and did programs (or programmes as we called them then) to analyse the Flight Test data for the VC10 and the BAC111, both of which first flew from Weybridge. This was more than usually satisfying, as I had first started work (1955) in Flight Test (LINK and LINK) spending hours operating a Friden calculator to get the results that now purred out of the Pegasus. Tommy Thomas, of Vickers Flight Test, was also pleased. It was the VC10 program too with which I experienced that great pleasure of a programmer's life, that of Starting Again. When I was given the job, John Reeve 'handed over' the existing Flight Test code, a 6 inch pile of documents, with many warnings as to what to look out for. Yes, Reader, I was able to ditch it all, and Start From Scratch.